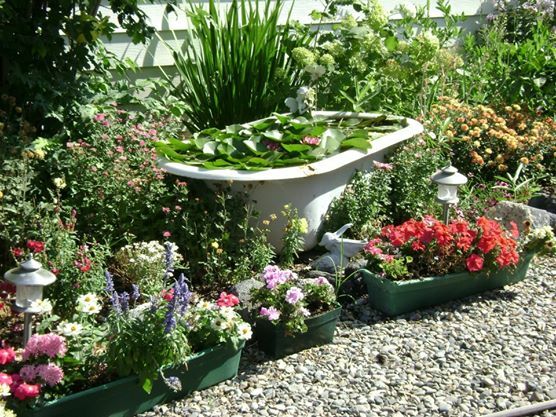 I have a cast-iron bathtub I’ve converted into a water garden. It’s heavy and ugly but makes the best place for lilies to bloom and fish to swim. For ten years it’s graced my flower garden, the sound of the fountain soothing on many summer nights. Years ago when I planted my water garden, I added ten goldfish. Nothing fancy, just ten small feeder fish from my local WalMart. I didn’t know if I had males or females, nor did I care. If they made it through the season I’d consider myself lucky. Being optimistic, I bought some fish food and as soon as the fish were acclimated to the water, I dumped them into the tub. Since I live on ten acres and have more than a water garden demanding my time, I didn’t hover over the fish. Most of the time I forgot about them, stopping occasionally to check how they fared. One—two—three I’d count anxious to know how many adapted and survived. Quickly I discovered they weren’t interested in the store-bought food. They were more interested in the organisms growing in the roots of the water hyacinths and the insects hovering over the water. So much better than the tanks at Wally World, my fish were happy in their new environment. Because I didn’t want my water lilies to freeze I purchased a water stock heater and placed it in the bathtub once the outside temperatures neared 30°F. The lilies didn’t freeze that first winter and neither did the fish. I’d read that goldfish eat their young so I wasn’t worried about the tub overflowing with new fish each year. Every spring I’d count the fish to see just how many had survived. The first year I lost three. The following year I lost two more. Yesterday I was outside getting the yard ready for winter. Still too early to install the water stock heater, I stood over the tub and watched, hoping to catch a glimpse of the fish. The water rippled and I started to count. One—two—three—four—five. Wait a minute. Six—seven—eight—nine—ten. Oh my gosh. My fish had multiplied. My fish had had babies and some of them didn’t get eaten. Like a happy child I clapped my hands. My heart was full of wonder. I watched the water garden a long time before I went on with my yard work. Nothing that day compared to the joy and surprise I felt as I counted those fish. Reproducing miracles. A ray of surprise and sunshine on a typically ordinary day. This entry was posted in Bonnie's Blog, year 2014 archives and tagged Bonnie Dodge, goldfish, miracles, water gardens, water lilies.